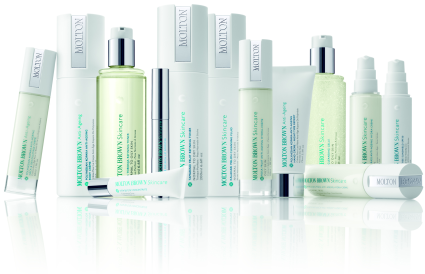 April 2012 marks the launch of Molton Brown’s first Anti-ageing Skincare and Bodycare collection. Offering low maintenance, high performance products with clinically proven results, the new range is engineered to help significantly improve the skin’s health and ageing process. Visibly effective and honestly explained with no ‘miracle cure’ claims or exaggerated promises, Molton Brown’s innovative no-nonsense capsule skincare collection offers four daily steps to naturally balanced, beautiful and radiant skin. Molton Brown’s skincare scientists have sourced the most potent plants and minerals from around the world. Each product in the 10-piece skincare collection has been designed for individual skin types and to target specific problems, including kalahari melon to keep skin supple, antioxidant rich malachite to pink toronja grapefruit which helps lift old surface cells to polish the skin. The new collection offers a comprehensive but easy to use skincare regime with targeted products for eyes and lips. Clean and prep with Kalahari Melon Cleansing Fluid and Tamarind Fruit Refining Toner for normal to dry skin or for normal to oily skin, try Malachite Cleansing Gelle and Pink Toronja Refining Toner. The clinically proven Anti-ageing Hydra-crèmes help lock-in moisture and soften the appearance of fine lines and wrinkles to keep skin looking younger, choose from the Creole Grass Anti-ageing Hydra-crème for dry skin, Rosa Fruit Anti-ageing Hydra-crème for oily skin and Peruvian Maca Anti-ageing Hydra-crème for normal skin. To shield from harmful UVA and UVB rays, Molton Brown’s Karanja Tree SPF30 sunshield has a light, matte finish to be worn under or over make-up. To help reduce the appearance of fine lines around the lips, the Pep-rich Lip Booster contains collagen-boosting peptides and African mango and papaya extracts to promote plumper, softer lips. The clinically proven Vita B3 Eye Concentrate contains vitamin B3 and ashbark to help fight dark circles and puffiness, with tetra peptides to soften fine lines and wrinkles. Complementing the skincare collection and extending the benefits further, Molton Brown is also launching a clinically proven, anti-ageing bodycare range. To help fight wrinkles, uneven skin tone and creases that make skin look older, the three-piece range contains the secret ingredient, Polynesian kopara - a highly purified marine extract from the Polynesian island of Moorea. This exopolysaccharide is naturally rich in essential minerals (potassium, sodium, magnesium and calcium) and helps maintain a healthy skin water balance, whilst protecting the body from pollutants that lead to ageing skin when blended with other ingredients. The Polynesian Kopara Anti-ageing Neck & Décolletage Crème contains mineral-rich Polynesian kopara combined with a sugar pea complex to help even out skin tone, peptides to minimize wrinkle appearance and paracress for firmer, smoother looking skin. For hands, the Polynesian Kopara Antiageing Hand Crème promotes strong, healthy nails through a blend of red algae, nutmeg, apple and daisy for firmer skin and a more even skin tone. The Polynesian Kopara Anti-ageing Body Crème is proven to offer instant and long-term moisturisation through deep hydration, with brown seaweed to firm and protect from pollution, and oat polyoses to help tone. Molton Brown’s innovative new anti-ageing collections promise time-poor women a touch of luxury with a simple regime that works. This is skincare as it should be - targeted, effective and intelligent.